I didn’t get any charity quilts in to share this week. Hopefully something will come in this next week. If not, that’s okay. It will keep me more mindful that I need to work on my own charity quilting efforts…which I have been putzing on. This spring Neighbor Girl was over and I started sewing some charm squares together to make a quilt like her’s. When I cleaned the sewing room, I found them sewn in strips and I started sewing them together…Here it is. It’s just simple squares but that’s okay. Hopefully I’ll come up with a good backing fabric. I do think I’ll make this a little bigger yet. As is it’s only in a 11 x 11 setting so it’s not very big. We’ll see. This is just what I have sitting by my machine that I putz on in between my things. I also got a note from Anita. 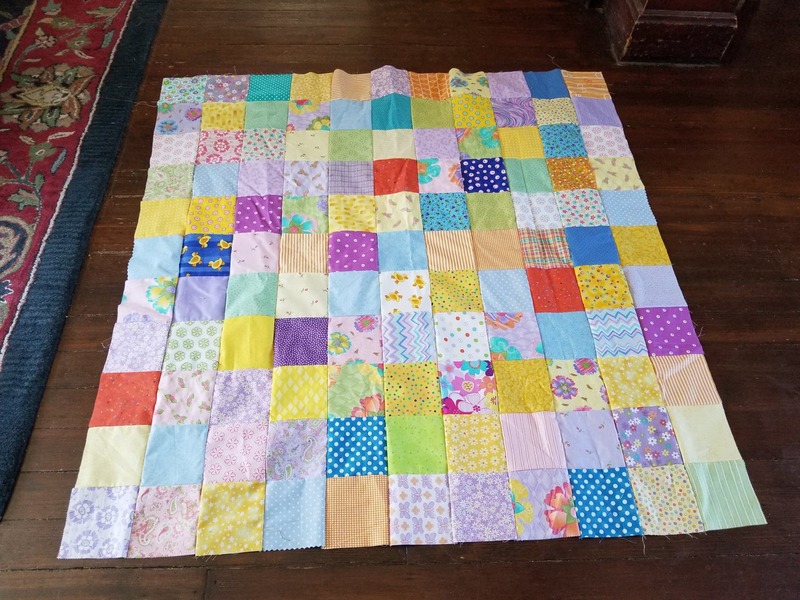 “Hi Jo, I am responding to a need for binding quilts for charities. I answered the online form and would like to take a moment to answer via email as well. I will accept one or two a month if available for binding and donating on to charities in our surrounding communities. I have no specific size to work on. It is one of my favorite steps in the quilting process. A completion is so rewarding. Currently my quilting bee group donates to the Ronald McDonald House in Charleston WV and to our community fire victims. I am a member of the Operation Jackson County Veterans in WV and would like to work with the officers to start donating Quilts of Valor. Currently we provide monetarily, for shelter and food and also for clothing and other necessities to veterans and their families. Although We emphasize on Mental Health. There is an immense need in rural WV. I am willing to provide photos of the completed projects and will work diligently with permission from the charities to gather a “back story”, behind the scene photos or even a recipient photo. Currently I am working on a masculine quilt from our The Beehive Quilters to put into our “quilts for donation” stack. It is of donated blocks and some background fabrics I’ve chosen. I will do a post on my blog about it in the near future. Well Anita, I am going to share your information here. Does anyone have any quilts that you are not longer interested that only need a binding? I know there are some quilters that do. Other projects are more important and that one project just never get finished. If you’re willing to gift it for charity, it sounds like Anita might be the person to get it to a finish for you. Feel free to send your charity quilt question or suggestions my way. rogjok@iowatelecom.net. This entry was posted in Charity Quilts on July 19, 2018 by Jo. I love the binding process as well. So many quilters dread that part. Thanks to your readers and to you for all they do. I just started quilting and love it. Being open to express color, patterns, and texture an is exciting hobby to share. I love making the tops and absolutely love sitting and sewing the binding! What I so dislike is quilting the project. This may be possibly because I don’t do it well?! It’s something that can make or break it. Thanks for including Ann’s note – I live fairly close to her, and have sent her a message! Thanks for sharing Jo! An update on our local Veterans efforts: “We are starting a new collaboration with another local nonprofit for training service dogs for PTSD and are looking for our first ‘client’. I sent today’s post about the charity quilting and the Canadian gal to my friend in Canada. She may be able to hook the gal up with someone. I am so impressed with all you do and enjoy hearing about your daily “doin’s”. I also lived on a farm for many years and come from a farming family.